But how what does playing football have to do with plugging in numbers and strategizing investment portfolios? According to Gordon, there is a direct co-relation. Gordon also points out that CFL players aren’t as well paid as one might think, with many working second jobs. 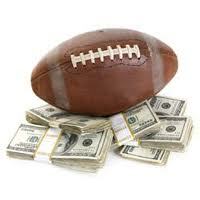 The average CFL salary in 2009 was about C$50,000 – with the highest salary reaching more than $150,000, according to the website huffpages.com. Compare that to the average salary in the NFL, that same year, which sat at US$770,000 the same year and reached as high as $10-15 million for the top football players. Meanwhile, The average salary of a financial advisor which ranges between about C$48,000 to C$75,000, according to payscale.com. “A number of our players have to hold down second jobs even in the season to make ends meet," says Gordon. "The compensation, should they become a financial advisor, is definitely more than what most are making as football players, so there is some appeal from a financial perspective, as well." The program saw three football players become financial advisors in 2012 - the year it launched - and is awaiting results from 2013.